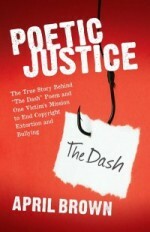 On January 7, 2015, Dash Poet, Linda Ellis opened fire on April Brown by posting comments, remarks, and warnings on her book marketing website GetPoeticJustice.com and informed April about smear-and-shame website JustFreeSpeech.com and LindaLogic.com/obsession.html by posting on April’s “Get Poetic Justice” Facebook page. They were the Dash Poet’s attempt to dissuade and discourage April from releasing her book. As a consequence, knowing April as well as I do and because of our friendship as well as our shared distaste for the Dash Poem copyright extortion scheme, I felt compelled to publicly defend and support April in a way that very few could. When someone attempts to commit reputational harm through out-of-context information, incomplete information, or outright fiction, the only way to combat it is to call the offending party out on it, challenge it, and passionately present your facts and argument armed with empassioned logic, reason, transparency, disclosure, explanation, and allow others to critique and make their own judgments. I tend to believe most people have the ability to discern the truth if there is complete information, disclosure, and transparency without the need to erect Chinese walls (as the Dash Poet continues to do). I support April the way I do because part of the Dash Poet’s strategy has been her attempt to damage April’s reputation by desperately tying her personal and business reputation to me and my so-called “stalking” case. Certainly, the Dash Poet has every right to call me a “stalker” until she passes out from sheer exhaustion (one can only dream). Likewise, I can and do call her a “hypocritical copyright extortionist” as well as many other politically-incorrect, insensitive, occasionally-sexist, profanity-laced names, which of course, is reflective of my own human failings, flaws, pettiness, and occasional stupidity. But guess what? I am not a perfect human being and they are all allowed by the First Amendment as long as I don’t engage in physical or safety threats which I have never done. People who know me absolutely know about most of my personal flaws and human failings where I engage in blunt profanity, name-calling, personal insults, rants, and occasionally petty behavior. It is no shock to them. I do all of these things in person, in my writings, and even in videos. I am reasonably consistent no matter what subject matter I am discussing or media platform I use. The reputational assault on April by the Dash Poet was not something I was going to tolerate and stand aside on especially when I am well qualified to speak to both parties especially in the “unique” case I have with the Georgia Supreme Court. So, yes, I was absolutely going to aggressively and passionately speak out on behalf of April. I also knew, at some point, that the Dash Poet would aim her shotgun my way. I was informed that JustFreeSpeech.com was registered October 11, 2014, four days after my and the Dash Poet’s Georgia Supreme Court oral argument session. That tells me that despite the fact it currently hosts “smear-and-shame” information about April, that website was originally intended for me. Stop blocking important pieces of fact and data. Stop blocking, twisting, and distorting the actual context. Try to show some real transparency, not a mirage of one. Don’t build Chinese walls when telling your story. Try not to be a walking, breathing hypocrisy. I know there are more rules than that but those were the five I immediately thought of. I never expected I would be involved with April’s book marketing efforts of “Poetic Justice” in quite this way. I thought I would simply pass the word along about her book. But April’s decision to release “Poetic Justice” and speak out on behalf of April has apparently resulted in my receiving my own “smear-and-shame” grenades thrown my way courtesy of the Dash Poet. I have no regrets standing up for April as she works to release her book. But I hope all of you will forgive the fact that I will also have to defend myself from the “smear-and-shame” grenades now being tossed my way. The upside to all this is that I think some of you might enjoy the drama as it unfolds. If you are the sort of person who wants to watch an imperfect and obnoxious person get grenaded upon and fight back with the weapon of words, come back to Defiantly. Better yet, subscribe by email! I promise I will do my best and tell some entertaining stories at my own expense! Admit it, we are all rubber-neckers to this sort of stuff. Need I say anything more? It appears that my outspoken defense of April and her right to publish her book about the Dash Poet and the Dash copyright extortion scheme is resulting in getting more collateral damage my way. Let the games (and stories) begin! Follow Defiantly on Twitter at http://twitter.com/defiantlynet or the Defiantly Facebook Fan Page at http://facebook.com/defiantly.net. Subscribe by Email to the Defiantly Blog in the Blue Box in the Upper Right Corner. CABALaw.org Asks: Why Does the Dash Poet Keeping Taunting Her Alleged Stalker? CABALaw.org Asks: Who is Stalking Whom? Matthew is the Publisher and Editor of Defiantly.net. He is also the Founder, Editor, and Host for ExtortionLetterInfo.com. Matthew is the author of several business books & audio programs. He is an entrepreneur, real estate investor, and First Amendment advocate.